When we look for a motorcycle helmet, the two main factors that we usually take into consideration are design and durability. The helmet must look good on us when we go driving down the street. At the same time, it should be durable and tough enough to protect our head just in case we get involved in a road accident. The GM54S modular street helmet by GMax has these very necessary characteristics. Featuring great aesthetics and a durable body, this particular helmet is a must-have for cyclists who put a lot of importance on design and safety. In this GMax GM54S review, we are going to look into some of the helmet's most prominent features. Nothing frustrates a motorcycle rider more than a helmet that causes too much discomfort either to the head or the neck. Fortunately, the GMax GM54S is designed with optimum comfort in mind. With that said, you don't have to worry about a part of the helmet poking into your face or causing pain on the top of your head. The GMax GM54S features a nice padding that is firm but not too hard. This padding has ample space on both ends to accommodate your ears. If you like listening to music while driving down the road, the padding also has some pockets where you can fix speakers. Not only that, the helmet is lined with DuPont Coolmax, a lining that's designed to keep your sweat off your skin thus allowing it to evaporate more quickly. This is especially important if you live in an area with a very hot climate. What's great about the GMax GM54S is that it has nine ventilation vents that you can easily adjust. Five of these vents are in front of the helmet with the remaining four at the back. Because of these vents, you have control over the airflow inside the helmet. If it's too hot, you can open and adjust all of the vents. If it's cold, then close off all the vents. The only drawback of these vents is that they may cause a whistling sound that you might find a bit annoying. The price tag attached to the helmet is totally worth it. It's a really good bang for your buck. 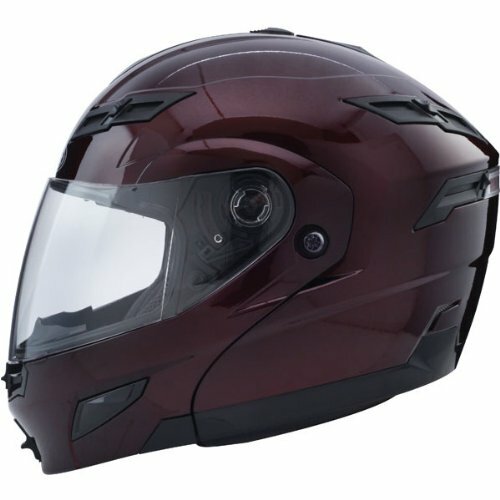 Not only do you get a lightweight and very durable helmet, you also get a ton of other features that you won't find in other brands and models that are double or even triple the price. For example, the helmet comes with a removable chin curtain which can be very helpful during cold and warm weathers. In short, you get all your money's worth. The GMax GM54S is a street helmet that every motorcyclist should have. Not only does it have a sleek design, it's also built with the rider's safety in mind. It is well-padded to protect the wearer's head and neck in cases of bumps and accidents. It also comes with a red LED light bar which is centered at the back to warn other motorists if you're driving in the dark.